For Part 1 and our introduction to the mini survey below, click here. For Part 2 and 3, click here and here. I’m quite involved with this question these days. Since December 2012, with the invitation to curate a contemporary art festival in Sofia primarily in urban public spaces of the city, I returned to the issue of the public space. I actually tried to stay out of it for a while, as this is a place with limiting and sometimes frustrating parameters of discussion. Because I don’t think what we define as public space is sufficient for the conditions that we are undergoing at the moment. I see this concept as white, male. After what was experienced in June in Istanbul, taking into consideration the potential of definitions in Turkey to change, I find this research more meaningful now. I think it is necessary to open it up, to transform it. What we can use instead of public space, I’m not sure of that either; we should be elaborating on it more. At the end of the day, we are stuck on the concepts of public space. At this point, I find it interesting to think about the biennial’s state. I think about the discussion of going inside from the outside. I think about what is seen as less public and what is seen as more public. Public is a plural singular concept in itself, and public space cannot be fixated on a single time-space. On the one hand, pulling the works into the interior exhibition spaces relates to the possibility of producing dialogues with the outside, rather than isolation from what is going on. This is a situation that can be understood differently when attempted to capture the existence, the side-by-sidedness in the same space. Some say that a big opportunity was missed and the biennial should have been outside in urban spaces, but from a larger perspective, the exhibition space is itself a very public space too. This discussion is particularly absurd in Turkey as our access to public space at the moment is limited and controlled by the police state. Public space is transformed into an Erdoğan elitism. Under these circumstances, the white cube is an elitist space, the exhibition should not be imprisoned in institutions, exhibitions are liberated when outside, are limiting our discursive horizon. Especially if we’re thinking about public space as a conceptual space of imagination and speculation. I’m a graduate student in museum studies. When you say public space, I immediately think about museums. These are places that are planned to be public in theory, but are not public once they exist in reality. They are places that a majority of society are shying from entering. In this sense, I was really impressed by an open-air exhibition that I saw on the way to the Eiffel Tower, over the Arc de Triomphe in Paris. There were huge photographs. What I felt going through that park was, even though I have to go to work every day, going to the museum would be very enjoyable. I don’t need to put in extra effort or to make plans, there is no need for advertisements everywhere. If I could make my brain work while going through those images, we should not expect everything from the museum. Even going up to something and looking at it means that art has entered the person’s life. Put it in the middle of the city, people can make use of it, they can get whatever they want from it. It is very important how a work in the public space relates to people. This work could be a performance, an installation, a screening, it could be a momentary intervention. At PiST///, we are a space really inspired by the street. I can say that we were jealous of the street, so we opened up a shop. The street that we are on is alive 24 hours a day with its own dynamics. We sometimes wonder about whether we are watching the street or the street is watching us. We find quotidian solutions, interventions that are done on the street, that are not done as art works to be very creative and artistic. Actually, the artist might try too hard and think too hard thinking about doing a work of art. Whereas the person on the street will make a sudden intervention to meet a need and this happens with a deftness that is much more quick than an artist’s. This process is something that we are open to and that we observe. Lately, I have been thinking about how an artist is affected by the street and how the street is affected by art. I made a film to be shown in Shanghai Biennial’s Bandung Pavillion in August 2012. 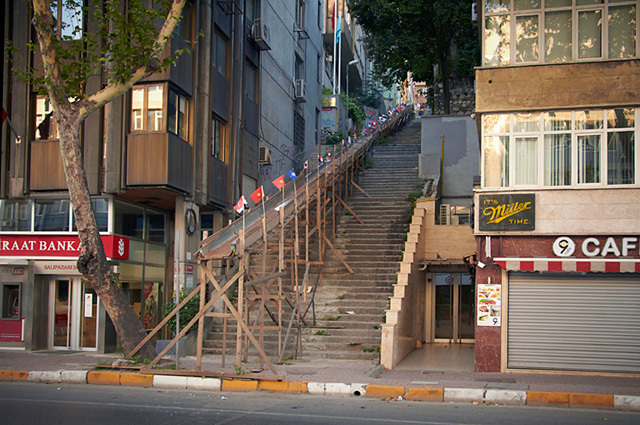 I did an intervention to stairs in August 2012 in Salı Pazarı by adorning the stairs with the flags of 29 countries, which had changed in the years 1955-2012. The work that I made was to adorn the stairs with the flags of different countries. I left the flags of 60 different countries there. Exactly a year after making this work, that same stairs was painted in the colors of the rainbow and the person who painted the stairs made the statement “countries’ flags are also colorful.” This was very exciting for me. He probably did not even know that what I did was an art work, because I always prefer to do a work without saying it is an art work, especially when talking to people who do not have art as a priority in their lives. I made an intervention there; an art work, a monument.. or i make the claim that it is a monument. But of course, this was a momentary intervention onto the street and it was not even indicated that it was an art work. Here is what my excitement about this: up until today, I was always inspired by something that somebody did on the street and I would re-interpret my observation in my work. This is not something that is specific to me—a lot of artists do this. But this time, my work made an impact on the person who painted the stairs since he defends his work by saying that country flags are also colorful. I understand this impact from his statements in the newspapers. While I couldn’t measure the impact at the moment, I experienced it a year later. Posted in content, on artists and tagged Didem Özbek, Nitsa Victoria Gormezano. Bookmark the permalink.